The Royal Crescent was the greatest open-air theatre in Georgian England. In the 18th century John Wood the Younger’s sweeping terrace of thirty houses became the stage upon which the fashionable visitors and residents of the city performed, promenading in their finest clothes, determined to see each other and be seen. On 29 July we celebrate the 250th anniversary of this famous building by once again turning the Royal Crescent into Bath’s largest theatre. The Royal Crescent will become a stage upon which Bath’s Natural Theatre Company will entertain residents and visitors with a series of performances inspired by the history of the building. From the wild parties of Mother Mac, through elopements and duels in the 18th century to scenes from Austen and Dickens in the 19th, on 29 July the fact and fiction of the Royal Crescent will be revealed. Bring a picnic, put on your finest Jane Austen-inspired clothes and join the celebrations. This year is the 200th anniversary of Jane Austen’s death. 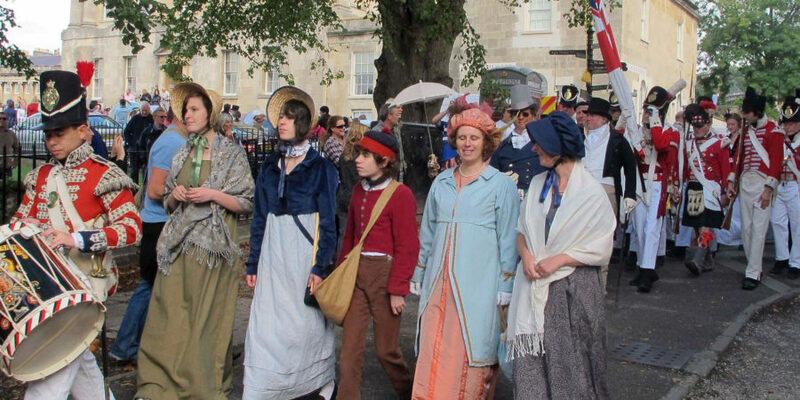 The 17th Jane Austen Festival takes place in Bath 8-17 September 2017.